I know that I quite often get accused of being a food snob but there are some really nasty skeletons in my culinary wardrobe. One of the nastier skeletons is some mass produced pierogies that went under the name of Gorby's. I guess the tenous link behind that name was that pierogies have a Russian connection and Gorbachev was in the limelight back then. These little abominations against what I now know as decent food was sold frozen (they might just had been chilled - can't really remember) and you either nuked them or heated them in the oven if you had the extra time. I'm sad to say that due to what only can be described as financial circumstances and lack of sense I ate more than one of these back in the day. I live in the hope that these things have disappeared from the shops but I honestly don't know if they have or not. If you want to see what one looks like, have a look at a picture of a Gorby's here. 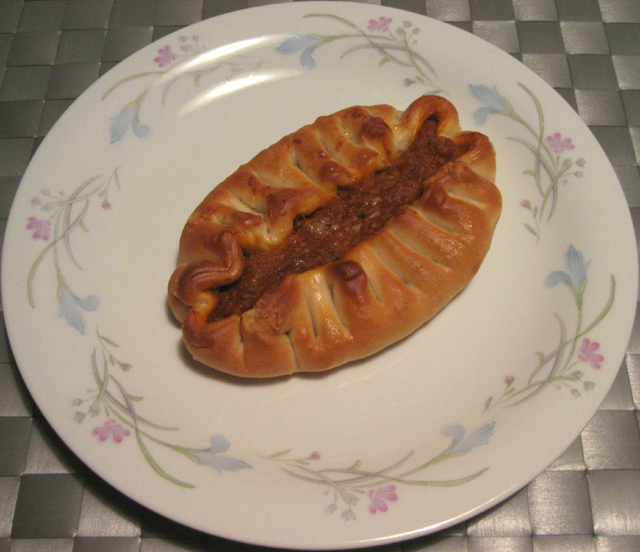 Having gotten that off my chest I can now move on to a slightly more proper version of a pierogie. This one is made from scratch and even if I say so myself, it plays in a completely different league than the Gorby's. I'm not sure how authentic it is, there might be an angry Russian outside my door one day but this is my version of it. Regular readers know that I actively encourage freestyling of my recipes and this one is no exception to that. Don't like pickled gherkins? Replace with some diced pickled beetroot for example. Don't feel like replacing, add the beetroot as well. Add in the fact that you can spice the mince to your hearts content and the possibilities are almost endless. 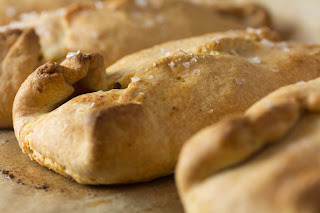 I know that it might seem a tad bit faffy to have to make the pastry the day before, but give it a go. The effort is well worth it. The quantity of ingredients in this recipe is enough for four large-ish ones but if you want to you could always make them a bit daintier and serve them as nibbles. Pop the flour, salt, butter and cream cheese into a food processor. Process until a firm dough is formed. Pat into a ball, cover with cling film and put it in the fridge over night. To make the pierogies take out the dough from the fridge and remove the cling film. Split it into four equal pieces. Mix together all the ingredients for the filling and season to taste. Roll each bit out on a lightly floured surface until it is about 3mm thick. Spoon equal amounts of the filling onto each one and fold together. Put the pierogies on a baking tray that you have lined with parchment paper. Brush each pierogie with melted butter, sprinkle with some flaky sea salt and pop the baking tray into the oven. Bake for 20 to 25 minutes, or until nicely golden to your taste.